Year 5 pupils adventure together at Hilltop Outdoor Centre for their end-of-year residential trip. The sun shone at the beginning of another hot day in July as Year 5 pupils and accompanying staff set off for Sheringham and our two-day residential trip to Hilltop Outdoor Centre. We arrived promptly at 10am and were shown to our rooms in Seaview House. Once bunk beds had been chosen and washing facilities duly inspected we gathered on the back field for some icebreaker games. The pupils worked together in large teams to complete challenges in the fastest possible time. Soon the laughter and excitement chased away any weariness from the early start and long coach journey. Sheltering from the heat of the midday sun we enjoyed packed lunches outside Seaview House before embarking on our first activities of the day. Over the course of our visit the pupils in three groups became our friends, support network, champions and heroes, as we laughed, listened, collaborated, trembled, encouraged (and sometimes screamed) together! The assault and agility course tested our skills of organisation, communication and comradeship as we scrambled under nets, swung over pools of water, negotiated tunnels and helped each other to step of the way. The climbing wall offered eight levels of difficulty and so many pupils took the Hilltop motto of ‘Challenge by Choice’ to heart, choosing to push the boundaries of their own comfort and exceed their own expectations by climbing a little higher and a little higher still. Needless to say, other pupils had no such decisions to make and scampered to the highest point like monkeys! It was agreed that the Super Swing is an activity best undertaken once breakfast or lunch has settled. The giant seat is winched high up into the trees. Those brave enough to tackle the red level found themselves facing a sharp drop before being swung back and forth in a wide arc. The writer is reliably informed that the view was great but, for that, I have to take the word of pupils and colleagues more courageous than myself. Topping the popularity stakes once again this year was Hilltop’s famous Tree Top Trail. Two levels of challenge allowed participants to select the height at which they completed the course and there was many a tightrope, tunnel and wobbly bridge to negotiate. 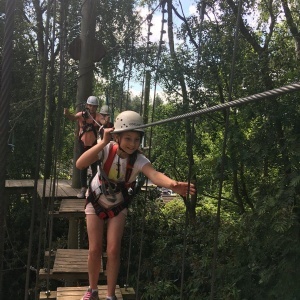 However, neither of the choices was an easy option and both pupils and teachers alike experienced feelings ranging from exhilaration to abject terror. For the record, in what other situation would you encounter a skateboard on a tightrope at 8m above the ground? Thankfully, we were all rigorously trained by the Hilltop staff in the correct use of our safety harnesses and smart clips. Aside from the safety equipment, the most important factor in completing the course was the encouragement, support, empathy and friendship shown by our pupils to one another. They cheered, clapped, comforted, helped and challenged each other (and their teachers). For others it was not the adrenaline-fuelled tasks which captured the imagination. One of our pupils, when asked what she had enjoyed most, responded that she liked the team challenges best because we all worked together. As we near the end of the academic year we feel immensely proud of our Year 5 pupils. They have grown in maturity as well as stature. They have faced difficulties and resolved problems, achieved huge successes and celebrated together. We loved our trip to Hilltop and what made it such a success was undoubtedly because we all worked together.